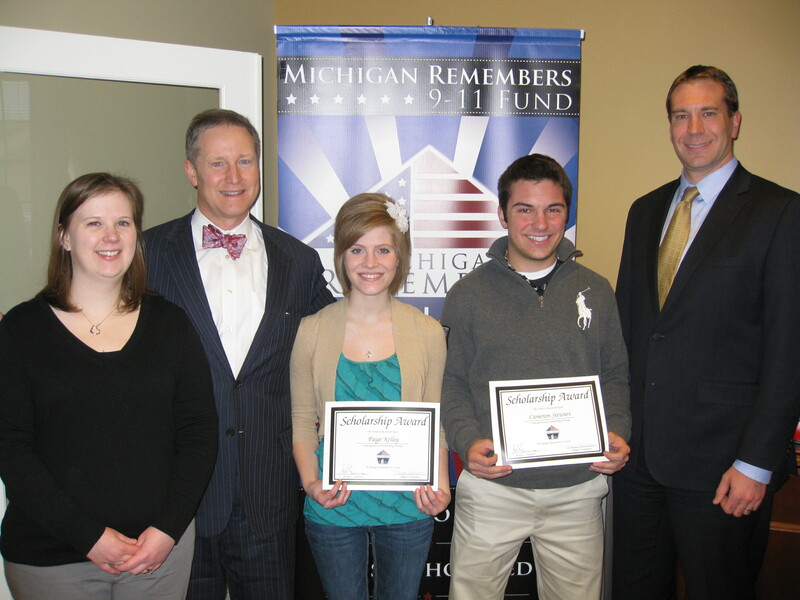 The Michigan Remembers 9-11 Fund is pleased to announce the winners of its 2013 scholarship essay contest for Michigan high school juniors and seniors. The contest is aimed to encourage Michigan youth to research and express their reflections on how the impacts of the September 11, 2001 terrorist attacks affected them personally, their family members or friends, their communities, or the nation as a whole. This year we were happy to award educational scholarships to three Michigan high school students. Cameron Stewart, a senior at Williamston High School, won the first place scholarship for his essay “Through the Eyes of a Child.” His essay discussed the attacks from the view point of a 5-year old child and how the aftermath affected him personally. He plans to attend Michigan State University in the fall to begin his pre-med studies. Paige Kelley, a junior at Williamston High School, was awarded the second place scholarship for her essay “An Attack Here and a War There.” She has a strong interest in the medical field and plans to attend college after she graduates next year. The honorable mention award was given to Nathalie Yanes, a senior at Wayland High School, for her essay “Michigan Will Remember.” She plans to study biology and mathematics at Calvin College in the fall. The winners were awarded their scholarships at a ceremony held on December 10, 2013 at the offices of Anderson Economic Group, LLC in East Lansing. Pictured from left to right are: Executive Director Megan Henriksen, Founder Patrick Anderson, Paige Kelley, Cameron Stewart, and Trustee Scott Watkins.